Chicago (2002): Dir. Rob Marshall. Written by Bill Condon. Lyrics by Fred Ebb. Music by John Kander. Based upon the musical of the same name with lyrics by Ebb, music by Kander, and book by Ebb and Bob Fosse; itself based upon the play of the same name by Maurine Dallas Watkins. Starring: Renée Zellweger, Catherine Zeta-Jones, Richard Gere, John C. Reilly, and Queen Latifah. Rated PG-13 for sexual content and dialogue, violence and thematic elements. Running time: 113 minutes. It’s certainly been a while since we’ve seen the movie musical (over 30 years, in fact!). Thanks to the success of 2001’s Moulin Rouge!,the movie musical came back with a bold, brassy vengeance. A musical of the mind (of sorts), Chicago features musical numbers that inhabit its characters’ fantasies (and sometimes, nightmares). When Roxie Hart kills her deceptive lover, it looks certain she’ll face the noose. Luckily, Roxie’s cuckolded husband has hired hot-shot attorney Billy Flynn to defend, with a plan that incorporates all the glitz of Hollywood to acquit his client. For all its gaudy debauchery, Chicago aims to be about something—the transience of fame, and the public fascination with celebrity. That most numbers occur in characters’ minds adds poignancy to the lives of these clearly delusional people. Director Marshall shoots these sequences on obvious sound-stages, with lighting that bathes the performers in an eerie white glow. He also effectively edits each sequence to emphasize the sharp choreography—something a director wouldn’t be able to accomplish on stage. Yet I wonder if the film basks too much in its own artifice. The satire, while initially clever, doesn’t necessarily surprise with its exposé of the media circus. 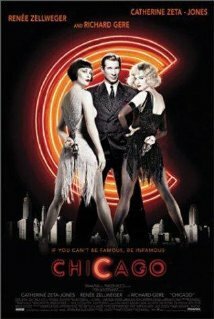 Certainly the characters of Chicago prance and pout like spoiled children, with Renée Zellweger’s Roxie Hart taking center stage (she manages to simper and still earn our sympathy, making her easily the best part of the film). But why litter the screen with ultimately meaningless characters like Queen Latifah’s Mama Morton or John C. Reilly’s Amos other than for one-off musical numbers? I admire the filmmakers’ attempts to craft a musical that goes beyond show-tune confection, but somehow it doesn’t go far enough. While sure to satisfy the palates of musical purists thanks to its deft direction, Chicago lacks the probing wit of great musical satire (read: Sondheim).